Whether you are a 19th century, Victorian, bit o’ jam suiting up for her courtship “coming out”; a swanky dame hep to the jive; a fifties dolly preppin’ to sock hop the night away; a fantabulous, eighties party girl, or are just looking for a slimming accessory for your favorite skirt HDE has you covered. Featuring three robust, double layered tiers for fluff and puff, this smartly constructed petticoat will keep you swingin’ without clingin’. Perfect for formal events, dance recitals, Halloween costumes, or to give a little extra flare to your day or evening wear. 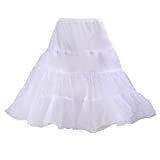 Designed with modesty in mind, this petticoat features an elastic waistband providing a flat fit, and an adjustable length. 25 ½ inches from waist to hem and available in a variety of colors, this clothing accessory is sure to be a flattering addition to any dress ensemble. Put a little hep in your step, and purchase this vintage style underskirt today!